We are pleased to announce that our office has been honored with Integrity Management’s prestigious Five Star Quality Service Award. 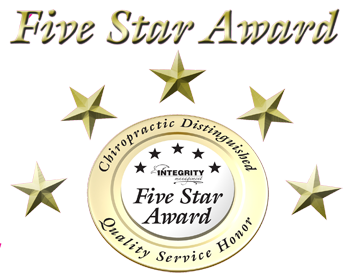 The Five Star Quality Service Award was developed as a means of promoting and publicizing superior chiropractic clinics that excel in patient treatment, customer service and professionalism. Clinics must go through an extensive examination and are graded on things such as punctuality, patient communication, equipment, the quality of services provided and patient satisfaction in order to even qualify for the award. You have made a great decision by choosing our office for your health care needs. Please contact us now to make an appointment. The Great Doctors of Chiropractic directory was established to identify and acknowledge service excellence in the chiropractic community. Our list consists of doctors of chiropractic found nationwide that have been recognized for their commitment to patient care, service, and practice integrity. Through our advisory board we have set out to inform the public about the benefits of chiropractic care and all the many positive effects it can have on your life. The Great Doctors of Chiropractic program was created in order to help educate and promote the benefits related to chiropractic care. Our list consists of doctors of chiropractic found nationwide that have been recognized for their commitment to patient care, service, and practice integrity. This professional directory is hosted as part of the chiropractictruth.com website which receives traffic nationwide from more than a half million visitors each year wanting to learn more about the effectiveness of chiropractic care. This list of doctors is compiled by the Great Doctors of Chiropractic Advisory Board, which is made up of some of the top experts in the profession. The board wants to make sure that you experience chiropractic care in a professional and patient centered environment. The member seal found on this website denotes that you have found an office that not only lives up to the standards of our program, but exemplifies chiropractic excellence in the health community.